The 403 Forbidden error is an HTTP status code which means that accessing the page or resource you were trying to reach is absolutely forbidden for some reason. 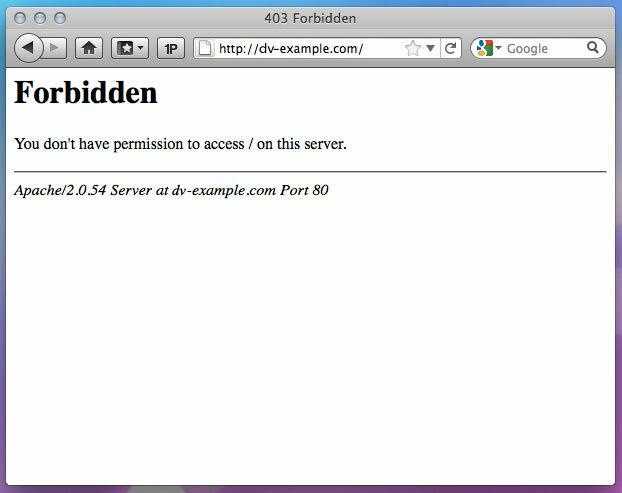 This article contains basic troubleshooting instructions for 403 Forbidden errors. There are three common causes for this error. Here they are listed from most likely to least likely. Make sure that your website content has been uploaded to the correct directory on your server. Remember to replace example.com with your own domain name. This is the path you will use for FTP. However, the full path to your website content is /home/00000/domains/example.com/html/. The 00000 is your site number. See this article for details. When you connect with your FTP user, you just need to navigate into the httpdocs directory. If this folder does not exist, feel free to create it. The home page for your website must be called index.html or index.php. To resolve this error, upload an index page to your htmlhttpdocs directory. Rename your home page to index.html or index.php. Set up a redirect on the index page to your real home page. See How do I redirect my site using a .htaccess file? for details. If you don't want a single page to display, but instead want to show a list of files in that directory, see Making directories browsable, solving 403 errorsMaking directories browsable, solving 403 errors. A 403 Forbidden error can also be caused by incorrect ownership or permissions on your web content files and folders. Please see File Permissions for a complete discussion of permissions and security. Linux permissions can be represented with numbers, letters, or words. They also include an entry for Owner, Group, and Everyone. Most FTP programs allow you to change permissions on a file or folder; see your FTP program documentation for details. You can also change permissions through SSH with the chmod command. See Common SSH CommandsCommon SSH Commands for details. You can change file ownership via SSH, using the chown command. See Common SSH CommandsCommon SSH Commands for details.